Nathan Myhrvold, an interesting character I’ve following for a few years now, has been in the news lately for his co-authorship with Maxime Bilet and Chris Young of the new food bible Modernist Cuisine: The Art and Science of Cooking (Amazon link). (Peep that beautiful, 100% WordPress-powered site.) I pre-ordered it forever ago, a fact that may surprise friends who know how little I cook, but I do love food and I was as interested in the pictures and the result of a detail-oriented and science-driven obsession with quality that goes all the way down to the stochastic printing process as the articles/recipes . The books are, in a word, stunning. I’m probably a lifetime away from attempting a 30-hour burger, but last night I did try a sous-vide approach to a New York sirloin and it turned out amazing. (Though that photo probably won’t be in a future edition of Modernist Cuisine.) The fact I can barely scramble eggs but made a super-good steak might portend the apocalypse. I think sous-vide cooking is something that will appeal a lot to engineers or analytically minded folks because it’s a controlled process with predictable outcomes. Nathan’s appearance on the Colbert report is a good 5-minute overview. Incredible Edibles, the Mad Genius of Modernist Cuisine is the New Yorker’s review. Cook From It? First, Try Lifting It, New York Times review. Serious Eats has had fantastic coverage, but I was most jealous of the 29-course meal from the Modernist Cuisine cooking lab. A 1997 profile of Nathan Myhrvold in New Yorker. His company Intellectual Ventures is controversial for its use of patents, as Malcolm Gladwell covered, the NY Times, an excellent Wired UK profile last month, and less kindly in Fortune. From this excellent New Yorker blog post there are links to profiles of David Chang, Grant Achatz, and a cool article on desserts that includes Albert Adrià. The Serious Eats sous vide steak article was my main guide for last night’s attempt, including their guides on resting meat, slicing against the grain, and general steak tips. Here’s a pretty friendly Youtube video for the same that is basically what I did except without the mushrooms or pre-sear. The eGullet forums appear to be a hub for all things modernist cuisine, and an epic thread about MC-the-book. If after reading/watching the above you’re ready to dive in like I was, I ended up with the Sous Vide Supreme after reading this review. 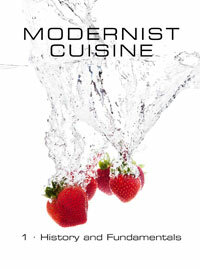 The WP-powered Modernist Cuisine official blog has a ton of great links and photos. Second, Mark Pearson of Pear Press (also associated with one of my other favorite authors John Medina) recommends the Pizza Nepoletana technique in volume 2 page 26 as an accessible dish, and the tip on decanting wine in a blender. Thanks to many friends for the links, and also for listening to me blather on about this for the past week or two. You may also be subject to more experiments in the future. 2008 article on Sous Vide with some recipes, including a nice-looking salmon one from Nathan. So glad I was wrong! Congrats! Do the advantages of the sous vide method portend the mechanization of professional cooking, the triumph of technology over craft? I don’t think so. Precision heating offers unprecedented control over texture and flavor, and consequently more textures and flavors to choose among — just as cooks can now choose from an unprecedented range of ingredients and techniques from all over the world. To say that Intellectual Ventures activities are “controversial” is tremendously diplomatic. Can’t believe anyone would link to this book on Amazon without an Amazon Associates link. 1 referral = cha-ching. I haven’t done affiliate links or ads on this blog for a few years now, it seemed weird to start it back up with this post. I read the NYT review. It all sounds sort of nuts. Do you think you’ll attempt any of the other stuff, beyond the sous vide technique? Very interesting conversation about Dvorak. I really like how he explained the cost vs. benefit.